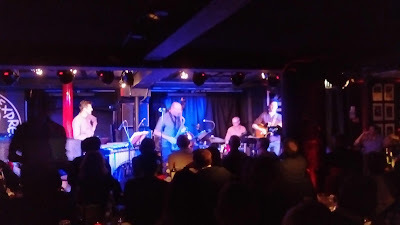 It is slightly more than eight years since the Tony Woods Project launched their last album, Wind Shadows, at Pizza Express, Dean Street and for fans of this inimitable style of UK jazz it has been a long wait for the new album Hidden Fires, launched at the same, packed out venue last week. The first set began with Queen Takes Knight featuring solos by Woods on soprano saxophone and Rob Millett on vibraphone underpinned by a lovely melody. Next came Hidden Fires with Woods switching to alto saxophone and launching into one of his trademark, frenzied solos - familiar to the west London Way Out West Collective audiences - which was nicely balanced by a really quite tender solo from Mike Outram’s guitar and Milo Fell’s inventive drumming. The next piece, Metamorphic, had the whole audience humming and swaying to another lovely melody played by Woods on a penny whistle, which at times sounded as if it had Irish and then African roots; Woods, now back on alto, and Outram traded melody lines to create a rousing finale. For the slow and mysterious Bonfire Carol, Woods switched instruments again to alto clarinet but the highlight this time was the exceptional guitar of Outram. The second set began with a nostalgic version of Wind Shadows from the previous album before reverting to Hidden Fires with the two tunes, Pantagruel and Gargantua. This music was commissioned to accompany an art exhibition, Gargantua being a historical giant and Pantagruel his son. Woods played Pantagruel on soprano sax and it started off as an amusing dance but as it progressed guitar and vibraphone joined in playing contrapuntally demonstrating the musicians' skill and mutual understanding and also Wood's expertise as composer and arranger. 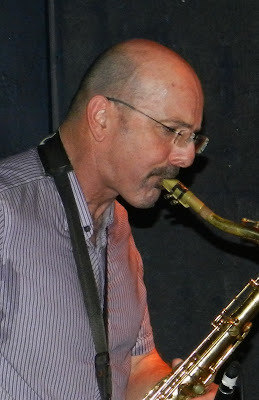 Emphasising the generational difference Woods changed to tenor saxophone for Gargantua and laid down a behemoth of a theme for Outram to dissect and explore in what was an exceptional solo (as you would expect from the professor of jazz guitar). The last track from the new album has a gentle introduction from Andy Hamill on double bass with Woods joining in on flute in a lullaby-style piece called Firelight. This was played as an encore after a storming version of The Meeting Place from the earlier High Seas album which had the audience clapping, cheering and demanding more. The whole band and Tony Woods in particular should be justifiably proud of their performance at Pizza Express and the quality of the Hidden Fires album. Their obvious assurance, which comes with individual expertise together with long association, was plain to see while Tony Woods' compositions and arrangements are both hugely enjoyable and extremely impressive. LINK: Tony Woods talks to Peter Jones about Hidden Fires.